These pretty flowers have an ugly side. 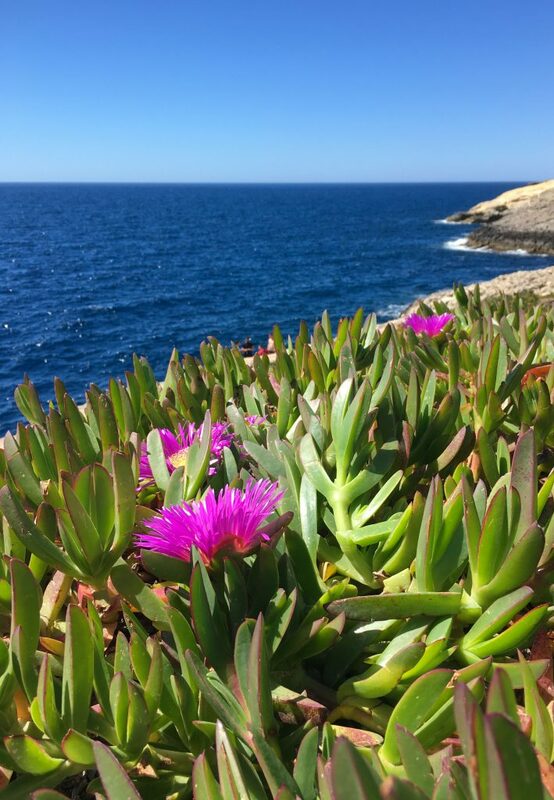 They’re Kaffir Figs (Scientific name: Carpobrotus edulis), and listed as one of Europe’s top 100 invasive alien species. They’re alien because they aren’t natural to Europe – the species was introduced from its native home of South Africa. Invasive because once planted, they take over. The dense mats seen in this photo grow rapidly, smothering other plants present. The Kaffir Fig’s warfare goes a step further. The plant changes the soil’s characteristics: its roots release nitrogen and carbon and acidify the surrounding soil, making it even harder for native plants to grow. This effect remains even after the Kaffir fig itself has withered away. Malta is one of a number of European countries that now battle against the species, after it was purposely introduced a while ago to pretty up public spaces and stabilise sand dunes. One of the plant’s Maltese names is appropriately ‘Dwiefer ix-Xitan’ (Devil’s nails). Though it sure looks pretty when it fights back, which may the reason for its alternative name in Maltese; ‘Is-Swaba’ tal-Madonna’ (The Madonna’s Fingers).